The alarm went off at 7am and upon looking outside we discovered that the cloud had dropped overnight so we were now surrounded by mist! Therefore neither of us were particularly motivated to get a move on. When we did eventually start walking it was 9:15am and the cloud was beginning to thin and lift. We ascended up the south ridge of Meall nan Tri Tighearnan, following occasional very faint paths back into the mist. Soon we reached the more well trodden ridge line and turned right to ascend up to the cairn which marked the summit of Meall nan Tri Tighearnan (Corbett Top). 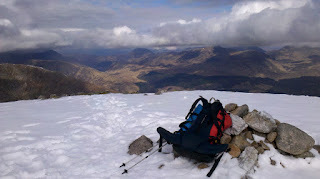 After a quick breather we descended to the east and began the snowy accent of our first Munro of the day. At around 10:15am we reached the summit of Glas Bheinn Mhor (Munro, Marilyn), from where there were occasional views north to the peaks on the far side of Glen Etive. Cloud kept blowing past us and intermittently obscuring the view, thus making it difficult to photograph! We descended the ridge to the east on a good path to reach the bealach. Here the path headed off down into the coire, but our way lay onwards and upwards across boulder fields and a steep ascent. Eventually the slope angle eased and we stopped for a moment to admire the views of the surrounding hills now that they were all free of cloud. We took a curving line up the gently angled, snow covered, slopes to reach the summit of Stob Coir'an Albannaich (Munro, Marilyn) at around midday. It was now lunchtime, so we sat on the summit admiring the excellent views whilst enjoying our tasty lunch of wraps, spicy cheese, salami and chorizo. Afterwards we descended the snowy east ridge for a few hundred metres before finding a safe place to descend down towards the bealach. The snow was a good angle for glissading and so that's how we made much of our descent - far easier than walking! From the bealach we ascended up to the summit cairn of Meall Tarsuinn (Corbett Top). After a brief rest for some mango, we continued along the ridge to reach the summit off our final hill for the day: Meall nan Eun (Munro, Marilyn). The views from here were some of the best of the while weekend and we estimated that we could see 50 Munros from here, including Ben Nevis whose summit had just come out of the cloud. Once we had finished taking in all the views, we retraced our steps for a few hundred metres before continuing down the north west ridge. Soon the ground became steep and craggy, so we had to carefully pick our way down to the coire below. By now the sun was back out and it was beginning to feel quite warm. That's a magnificent picture, Alistair.